So many languages. So little time. I’ve been writing software for more than thirty years – I started very young, really – and I’ve learned several languages, and had to write the same components over with over with each one. An ever-expanding universe of those languages is becoming a drain on productivity. After my wife’s car accident. My wife had a car accident the other day. The insurance company’s claims people called today to tell her that they were writing the car off. My wife’s doctor has told her to take at least two weeks off. She works with kids in a day care and she just isn’t up to looking after them. The insurance company – State Farm – also called today to tell her that they won’t compensate her for any lost wages until she uses up at least seven (7) days of her sick leave and short term disability if she has any. So keep this in mind before you consider moving to Canada.An idiot ran a red light and hit her. There were plenty of witnesses. He got a ticket and walked away. My wife’s car rolled several times and she went to the hospital in an ambulance. This whole thing isn’t costing my insurance company a thing. But so far, my wife loses seven sick days at least. So who’s the one being punished for being the victim here? Nokia: Takes a licking and keeps on phoning. After my wife’s accident I went around the car picking up things that had been thrown from the car. When I went to get here sunglasses I noticed broken pieces of her Nokia cell phone. The phone had obviously travelled quite a distance; I found parts scattered about 50 feet apart. I gathered up all of the parts that I could find and put them in a bag. When we got home I put everythingtogether and powered it on. It worked just fine. Now that’s a dependable product! No wonder we’re so happy with our Nokia phones. My wife’s Mazda saved her life. On this past Wednesday, my wife was in a car accident. An idiot in a Mercedes E550, on his BlackBerry at the time, went right through a red light and hit my wife. 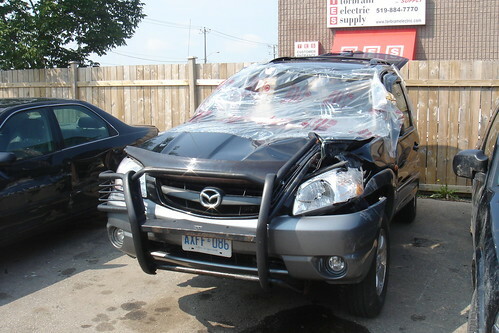 Her 2001 Mazda Tribute rolled a few times, coming to rest down the road on its roof. Fortunately a couple who lived in the apartments at the corner got her out before anything happened. 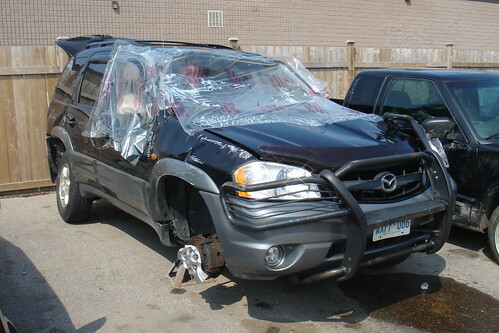 Her Tribute, though it sustained a few dents and bent axles, was in remarkably good condition (see pictures below). The police and firemen were amazed that she was able to walk away, so it probably saved her life. So my thanks to Mazda for building such a dependable vehicle. Let’s just make up the conclusions. -"Some people say that the high cost of oil and gasoline is a reason why we should take a slower, more cautious approach to dealing with environmental issues such as climate change, so that we don’t drive up the cost of fuel and the cost of living even further." -"Others say that the rising price of fossil fuels is a reason we must move even more aggressively to reduce our dependence on fossil fuels and find alternative sources of energy that are also less damaging to the environment." The survey indicates many Canadians profess to want environmental actions that push the country toward greener, alternative sources of energy – regardless of cost. In fact, there is nothing in the questions that asks about what Canadians would be prepared to spend.It also doesn’t ask in any way if Canadians want environmental actions. And guess what kids – slapping a carbon tax on everything doesn’t reduce our dependence on anything. It just makes it cost more. So here’s the big question. What are we doing, or what is anyone proposing, that we actually do to reduce our dependency on fossil fuels? The cost of free flights. That’s right. $299.68 in taxes and surcharges for my "free" flight. Then again, it is every Canadian’s human right to be overtaxed. And Toronto is the most expensive airport in the world after all. Just for fun, I thought I’d check the price for the same flight out of Buffalo, NY, not that far away, and a place we often fly out of as well. The total for the same flight was $494, with a $100 discount if I use my Expedia.com credit card. I thought I’d check the actual ticket price for the same trip on Air Canada. A whopping $1419.80, almost three times the cost of the flight from Buffalo. Even knocking off the taxes and surcharges, that’s more than double the flight from Buffalo including all taxes. So how is it that Air Canada can’t seem to make a decent profit?